Cancellation Policy: Must cancel 72 hours prior to check in or a one-night cancellation fee will be applied. 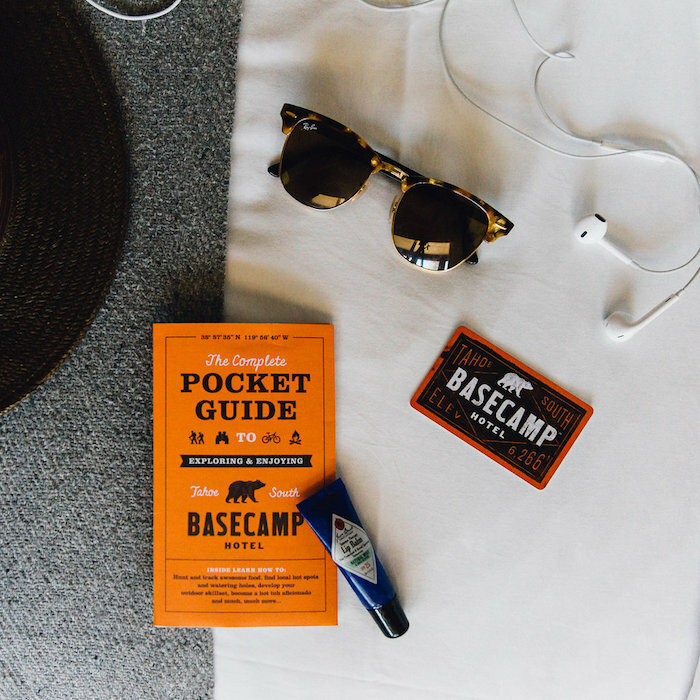 Pet Policy: Basecamp Hotel does allow pets in designated rooms. There will be a per stay pet fee of $40. Dogs must be attended to at all times and cannot be left alone in the room. For referrals to pet sitting services please contact the Front Desk. A cozy room with a King sized bed, our Standard King rooms are located on the First and Second floors and feature a walk-in shower as well as our standard amenities. Pets are not permitted in these rooms. 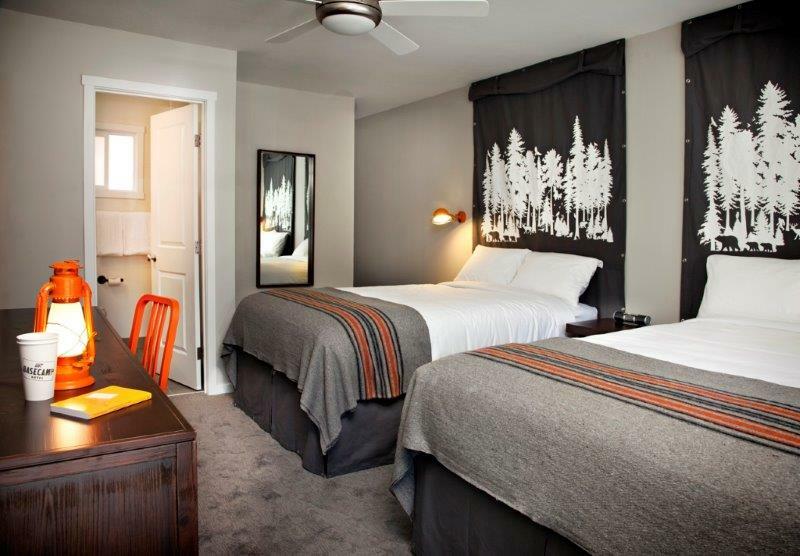 Our Full Full rooms feature two Full sized beds, a walk-in shower and our standard amenities. Our Full Full rooms are located on the first floor. Pets are not permitted in these rooms. Our Queen Queen rooms feature 2 Queen sized beds. Perfect for up to four people. These rooms are located on our second and third floors. Pets are not permitted in these rooms. 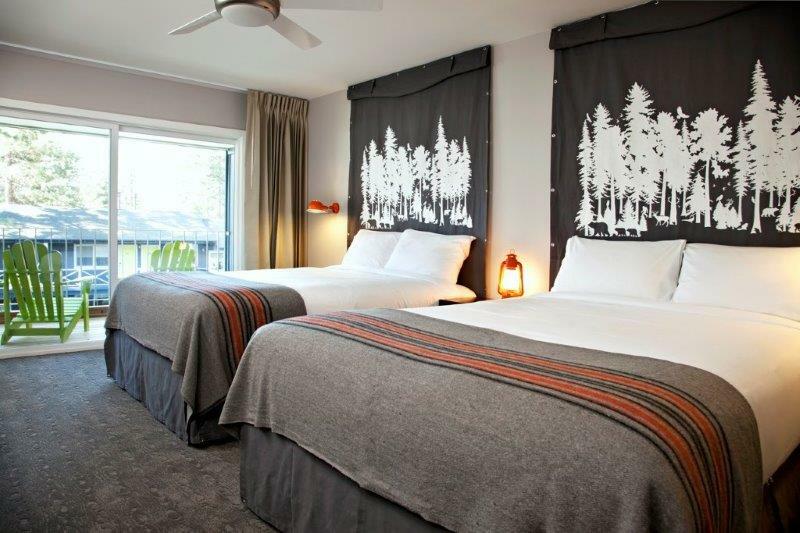 Our King Balcony rooms feature a King sized bed, walk-out balcony with two Adirondack chairs and our standard amenities. These rooms are located on the second and third floors. Pets are not permitted in these rooms. Designed with the Independently-minded Traveler. Our Indie King features all of our standard amenities plus a refrigerator and microwave. These rooms are located on the first or second floors. Pets are not permitted in these rooms. 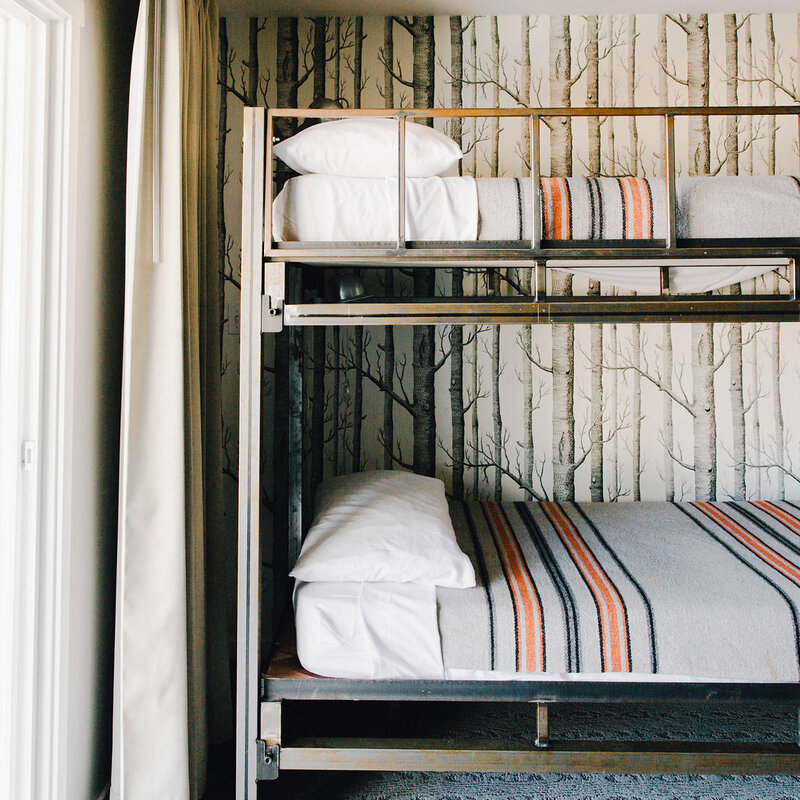 Our Indie King Bunk is a family friendly room featuring one King size bed and a set of Twin bunk beds. Our Indie rooms feature all of our standard amenities as well as a refrigerator and microwave. These rooms are located on the Second Floor. Pets are not permitted in these rooms. Our Full Full Balcony rooms are located on the Second Floor. Pets are not permitted in these rooms. Designed with the Independently-minded Traveler. Our Indie Full Full features all of our standard amenities plus a refrigerator and microwave. Designed for the independently-minded Traveler. Our Indie Full Full features two full sized beds, all of our standard amenities, plus a refrigerator and microwave. 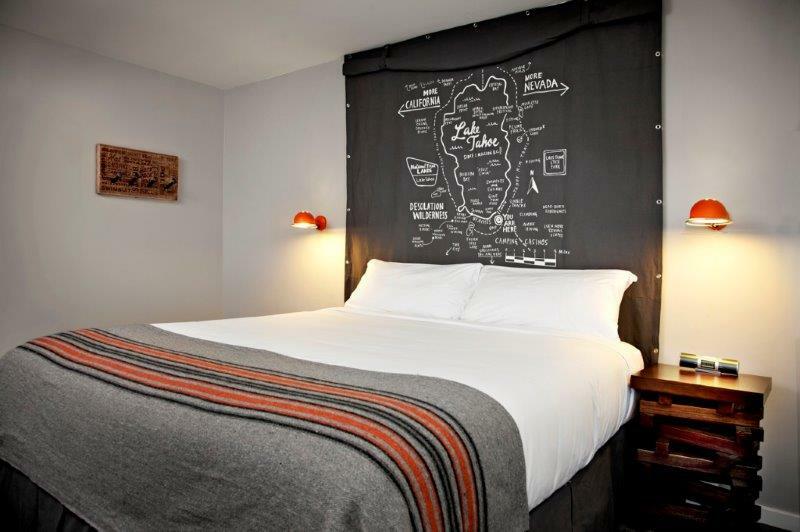 Our Pet-Friendly Indie Full Full also offers the convenience of a room on the first floor. Our Queen Bunk is a family friendly room featuring one Queen sized bed and a set of Twin bunk beds. These rooms are located on the Second Floor and also feature a balcony. Pets are not permitted in these rooms. 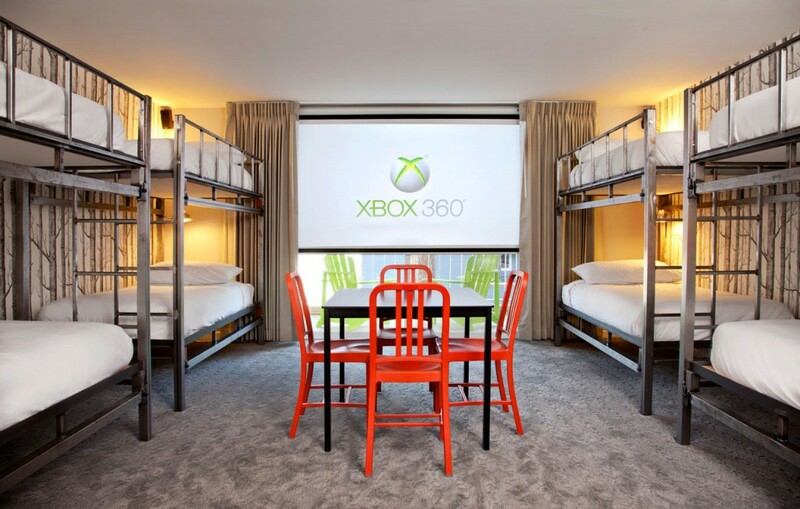 Our Explorer Room features 4 Twin sized bunks, accommodating up to 8 people. This room is a fun and affordable option for a casual group. Pets are not permitted in this room. Love camping, but don't want to risk the weather or wildlife? This room is for you! 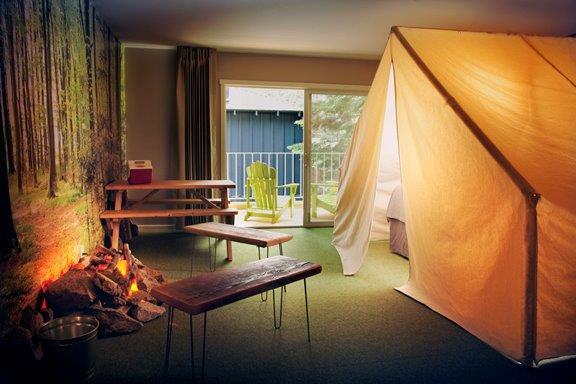 You'll get the feeling of camping outside while being inside with your own bathroom and a California King bed. Complete with tent, faux fire, and glowing stars. This room also features a walk-out balcony. Pets are not permitted in these rooms. Our King Room is located on the First floor and is Wheelchair Accessible.